German artist Diemut Strebe teamed with scientists to create a living art piece - a living replica of Vincent van Gogh's severed ear. Vincent van Gogh cut off his ear in 1888 for frequently debated reasons - most often lunacy. One artist and a team of scientists have now created a living replica of van Gogh's ear thanks to 3D printing and DNA from his brother's great-great grandson. Lieuwe van Gogh is the great-great grandson of Vincent's brother Theo. He shares 1/16 of the same genes as Vincent van Gogh and the Y-chromosone. 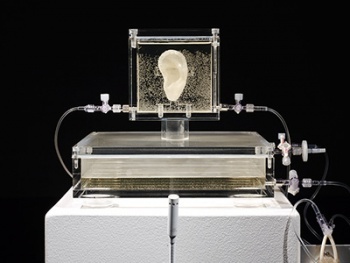 Using his DNA samples, German artist Diemut Strebe and scientists used a 3D bioprinter to print the skin cells to exactly resemble Vincent van Gogh's severed ear. The ear contains both genetic information about van Gogh and engineered components. The ear was grown in Brigham and Women's Hospital in Boston. The ear could be kept alive for years as long as the cells are fed a nutrient solution. Strebe told the Associated Press that she wanted to combine art and science. She plans to hold a full exhibition for her art early next year in New York. For now the replica ear is a part of the Sugababe exhibit in Germany until July 6. The ear will be a living art piece to this date thanks to the nutrient solution it is fed.